Marking the jubilee of 170 years of the Military Medical Academy, a solemn academy was held in the Topcider Guard House. It was attended by the President of the Republic of Serbia Tomislav Nikolic, Defence Minister within the acting government Nebojsa Rodic, representatives of the government, Serbian patriarch Irinej, SAF General Staff Head General Ljubisa Dikovic, Defence Ministry and Serbian Armed Forces representatives, as well as the representatives of religious communities, foreign military deputies, the MMA friends and colleagues. 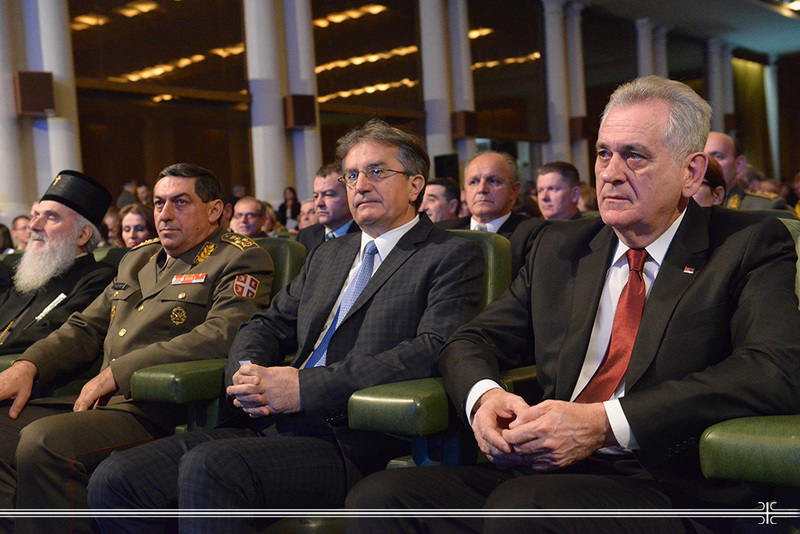 Congratulating the anniversary, President Nikolic reminded on rich tradition this military medical facility enjoys, pointing out that Serbian citizens mostly have confidence in Serbian pillars, where, among the institutions, were ranged Defence Ministry and Serbian Armed Forces. - Military medical system majorly influenced in trust building, but its vital part and moving force is Military Medical Academy. It represents the institution of national importance and, during the decades, the one of the largest and the most eminent military hospitals in South Eastern Europe, President Nikolic said. According to his words, the sphere where our physicians earned admiration and respect of their colleagues in the world and relevant reputation, is plan to include the field of international collaboration and deployment of our medical teams in multinational UN and EU peacekeeping operations. -That is the way to promote the acquired competences and skills of our military physicians and other medical staff, and the way to proudly present our country on the world level- pointed out President Nikolic, adding that military medical staff is a proud of Serbia because setting up and defending the highest standards in the field of treatment, preventive medicine, education and scientific-research work. He expressed the belief that the MMA employees will justify in the following period their reputation in the country and the world, continuing with the top results in this ethical profession, as well as technological modernization and education of young doctors and other medical staff. -I expect that MMA will keep and improve the reputation of an elite medical institution and remain recognizable in the region and the world, as the proud of the defence system, healthcare and state in global sense- concluded President Nikolic. The Head of the Military Medical Academy Brigadier General Prof. Dr. Marijan Novakovic pointed out the fact that this facility past the long way since 1844, when according to the Decree issued by Prince Aleksandar Karadjordjevic, it has been established, until the present day when marking 170 years of existence. -Although in course of long and turbulent decades, our facility was changing the names and places, it always followed the destiny of its people, thus growing and widening human activity in accordance with Serbia, whose symbol remained until today- emphasized General Novakovic. He added that jubilee coincide with the 100 years until the beginning of the Great War, when Serbian military medical service gave a large contribution to the victory of ally army and this evening program is also a reminding that MMA in all phases of work has deep roots with Serbian popular tradition and government. One of the facts pointed out on this occasion is that MMA has been founded with the noble goal to support their people, either during the wars and suffering or raising and developing, at any time during the hard and the hardest, its physicians and nurses carried out their activities on the first front lines and the first treatment lines, without the right to make mistakes. -As an institution of national importance, integral part of the Defence Ministry and Republic health system, as well as the system of education and science, Military Medical Academy have the same aim as once, which is, at the same time, the basis of our work. It is, precisely, both needful and necessary improvement of medical services. Along with continuous care of patients, which are the reason of our existence, we also educate future generations of doctors. Applying world health standards, MMA intensively deals with scientific research, always in the service of more treatment efficacy, and collaborates with the countries and international organizations around the world, said the MMA Head. He brought up that continuous modernization of practical and scientific potentials, all the MMA employees consider as their personal ethical, professional and national commitment along with an authoritative aspiration to improve Serbian healthcare with the other professional institutions. Beside the MMA anniversary, the program was also dedicated marking 100 years since the World War I. Therefore, the guests had the opportunity to see the compositions performed by eminent musicians- artists accompanied by Art ensemble “Stanislav Binicki” and drama monologues performed by actors.